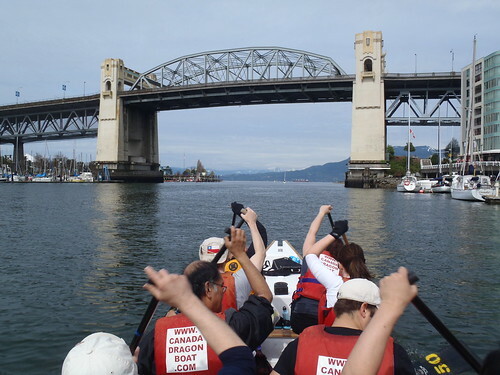 Earth Day paddling in False Creek…. 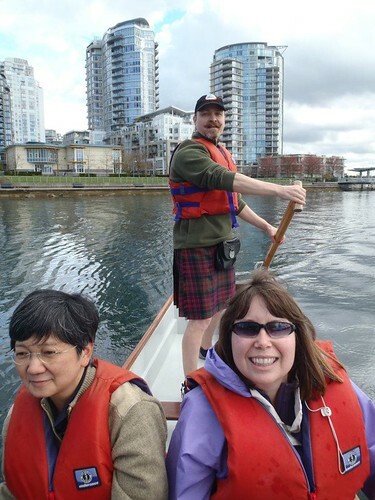 Happy Earth Day… we celebrated on our dragon boat practice for the Gung Haggis Fat Choy dragon boat team, by recognizing some of the aquatic and environmental highlights of False Creek. We talked about some of the ways False Creek has been cleaned up since the 1970’s, and how the Expo 86 site made a big difference. We pointed out where Sweeney’s Barrels used to be and is now Cooper’s Park. 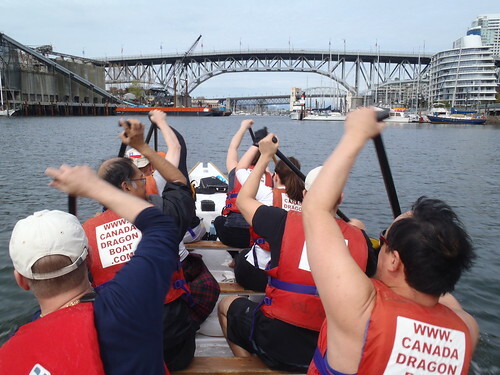 The first dragon boats were donated by the Hong Kong Pavillion, and on display for the festival in what is now the Yaletown habour. False Creek used to be all industry with mills, factories, etc – but now it has been cleaned up to the point that herring eggs … and oysters… are now alive in False Creek. 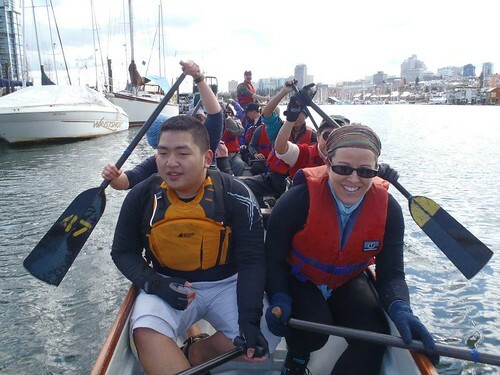 Here we are paddling into the bay at David Lam Park, where Earth Day celebrations were held with author Eckart Tolle. I am holding a dragon boat paddle, as we do stretching exercises midway through our practice. – photo Dave Samis. It was actually quite warm and the sun was deceptively burning… I now have sunburn on my forehead. Usually I always have a cap to wear on my head… but I took that into the house the other day when I was wearing it in the rain. 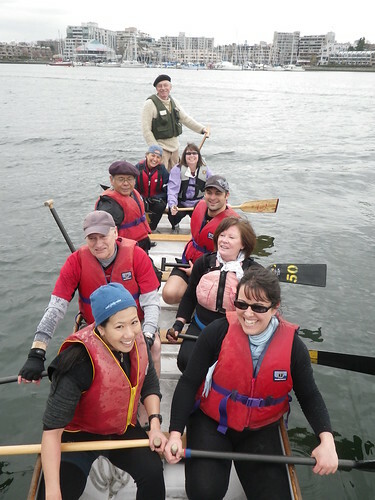 After paddling, some of us went to all-you-can-eat at Ji Sushi, on the NE corner of Broadway @ Cambie. Then I went to check out Earth Day celebrations at Grandview Park on Commercial Drive. Nice to see the displays and the dj’s were playing reggae music. 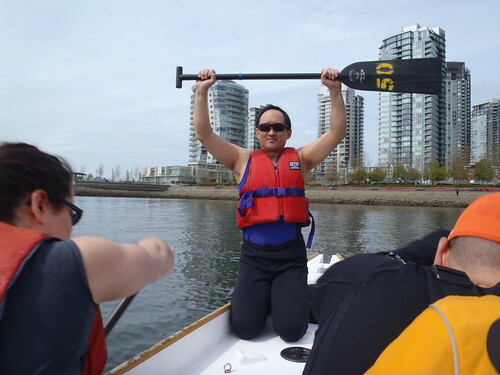 This entry was posted in Dragon Boat Information, Dragon boat with Todd Wong - Dragon Boat Coach, Gung Haggis dragon boat team information on April 23, 2012 by admin. 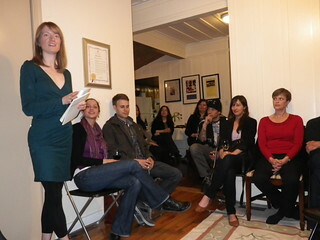 – our inaugural writer-in-residence from 2009. 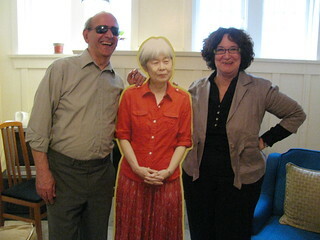 Tuesday, April 17, 7:30 till 9:00pm, for readings from his new poetry collection, Blindfold. John Asfour served as our inaugural writer-in-residence in 2009, and during his three-month residency he completed this moving collection of poems on the distance surrounding disability. 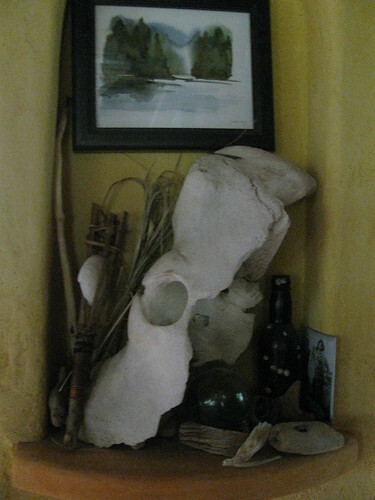 The poems were published in 2011 by McGill-Queens University Press and were recently selected to tour North America for the Association of American University Presses Book, Jacket, and Journal Show. 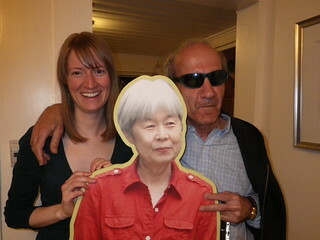 This entry was posted in Literary Events, Uncategorized, Upcoming Events on April 17, 2012 by admin. From March 29 to April 14, the GungHaggis.com blog was down due to migration to a new software program. All stories and pictures have now been migrated to Word Press format. But this now updates our presentation abilities with up-to-date blog software. The previously used Blogware software was a pioneer in 2003, when Gung Haggis Fat Choy blog was first launched. It held up pretty well, without significant changes, while the blogware added taglines, and the social media world turned to Facebook and Twitter. In the next few weeks, we will try to maximize the presentation options available through the Word Press format. 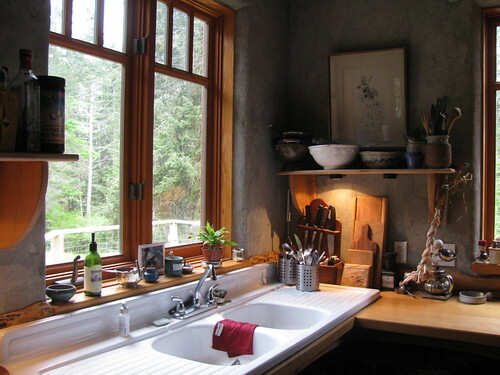 The first post that I wrote was a history of the Gung Haggis Fat Choy Robbie Burns Dinner starting from the first 1998 dinner for sixteen guests. 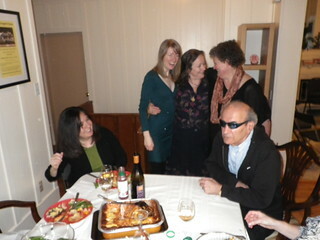 It also described the upcoming 2004 dinner that had been expeanded to two nights to host five hundred people. Sometime in the 21st century, Todd sports a smart ensemble consisting of a dragon’s head and a kilt. 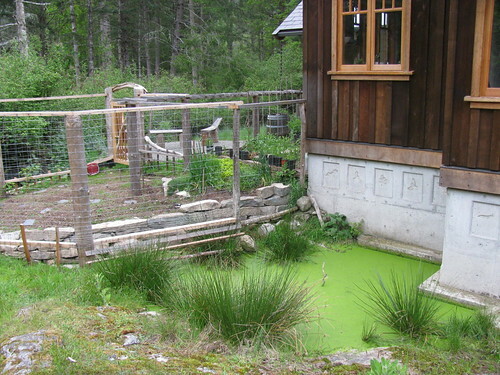 Our blog site is mentioned in the Vancouver Sun! We’re almost famous now! By December 13th, the brand new two-week old blog was mentioned in the Vancouver Sun. On page H1 is an article called “Life is but a blog.” On page H2 is a continuation with a call out titled B.C. Blogging Sites and Blogs – which included the Gung Haggis Fat Choy blog. December 19th post gave a brief description of the upcoming CBC television performance special titled “Gung Haggis Fat Choy”. It was amazing to be part of the creation of this program, which also featured performances by The Paperboys, Silk Road Music, George Sapounidis, and my good bagpiper friend Joe McDonald and his band Brave Waves. 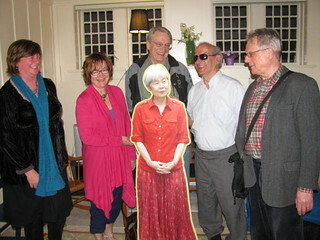 Here is a link to a video clip, produced by Moyra Rodger of Out To See Productions. Check it out to see a re-creation of the first dinner for 16 people, but with my parents and my then 94 year old grandmother.